As autumn approaches I have my eye on Paris. October is my favorite time of year in the city I love, particularly when it comes to seasonal food. Of course, in my opinion, the food in Paris is wonderful throughout the year but some of my favorites are available during the time when the leaves are turning colors, the air is getting brisker (and Parisians are getting grumpier!) and the layers are being added. Here are my five favorite fantastic Fall foods. I love soup. Mr. Misadventures makes a big pot of some kind of vegetable nearly every Sunday. But my favorites always seem to be the traditional autumn harvest foods like squash. I never tasted chestnut soup until I moved to France and had it in restaurants in Paris my first Fall. It is wonderfully nutty and creamy (even when you don’t add extra cream!) and versatile too. You can throw in extra pieces of the chestnut as a topper, porcini mushrooms, croutons or prosciutto, as well as a little dabble of cream. It is rich and yummy and really healthy (if you eat it without the cream!). 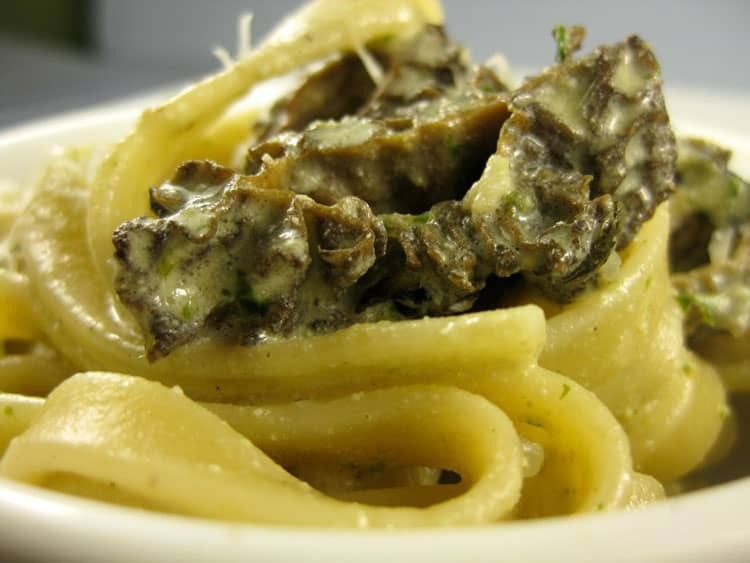 Pasta with morel (morrilles) mushrooms. Photo credit: Joan Nova. It is limitless what you can do with mushrooms! But I love when Fall comes around and you start to see morrilles (morels) appear on menus. I personally like them in pasta with a light cream sauce, but Mr. Misadventures makes a wonderful chicken dish with morilles and walnut wine. In addition, I think that the French make the best omelets in the world and there is nothing better or simpler than a mushroom omelet with fine herbs. I am not a big pizza fan, but I love a minimalist pizza (thin crust, sauce, light cheese) and tons of mushrooms piled on, yum! In the same family, but not in the same price range, the truffle is something spectacular to behold. If you want to experience a real treat, head over to the Maison de la Truffle in Paris (there are 2 locations) where you can purchase a sampling in their store or eat in their restaurant. 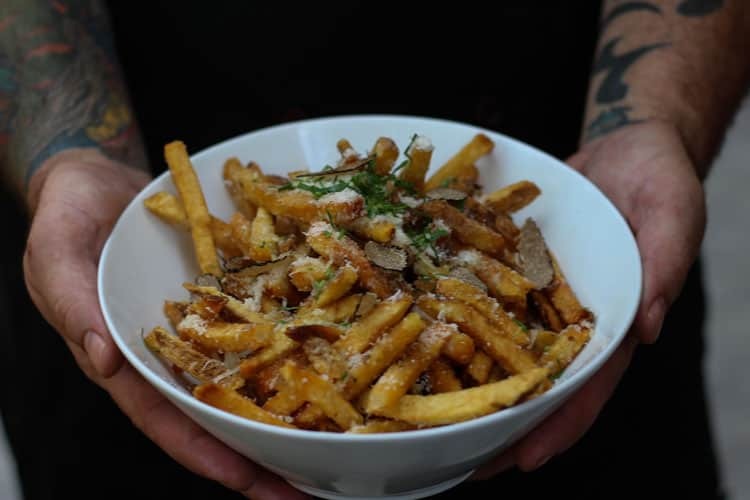 The three classic ways to eat truffles are in an omelet, shaved over pasta or french fries, but there are also people doing very creative things with this little tuber! On my personal bucket list is to visit and stay in one of those hotels in the South of France and have an entire meal of truffle dishes served to me from beginning to end (we ended up doing that in Tuscany), but until then, there are plenty of great places to eat truffles in the Fall in Paris! Sorry, I don’t know the English equivalent of this type of food. It is venison, wild boar, those kinds of Fall hunting meats. These are not so easy to get in the U.S. depending on where you live but are plentiful in Paris and France. In fact, you can get these type of meats year-round at restaurants like A la Biche au Bois near the Gare de Lyon train station. I ate there many years ago and still think about that place. David Lebovitz wrote a post about it that I still check it out from time to time! 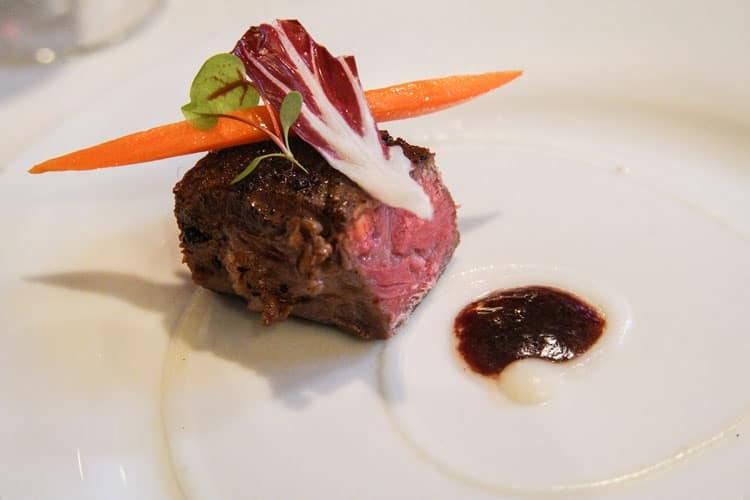 It is difficult to explain the taste, to me, it tastes, well, like meat, but more crisp, more natural. 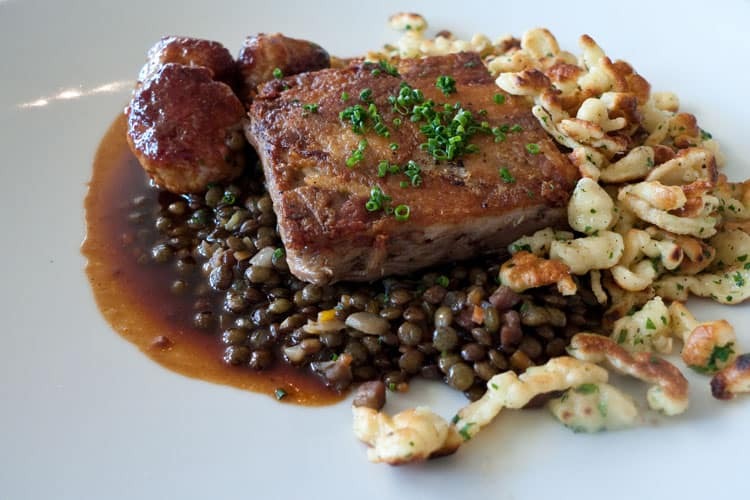 The traditional side dish served with gibiers is spaetzle and I love it! It is an egg noodle that is chopped into small pieces and boiled in water. It can be prepared very badly, but when it is good, it is very, very good! I have yet to see this dish in the U.S. (doesn’t mean it doesn’t exist) and I definitely crave it from time to time. The best I ever had was in Switzerland, but I have had some excellent servings in Paris as well. It is the perfect delicate accompaniment to hearty Fall meats. 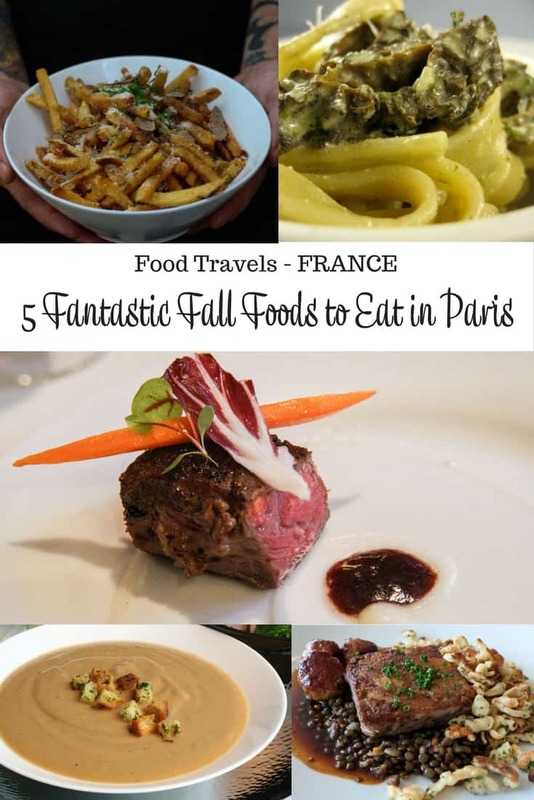 Those are my favorite French Fall foods to eat in Paris. What are your favorite Fall dishes at home? What are your favorites from abroad? And if you are heading to Paris anytime soon, consider purchasing a Paris Pass before you go, it will save you money on many Paris attractions, leaving you more money for French dinners! I learned a lot here. 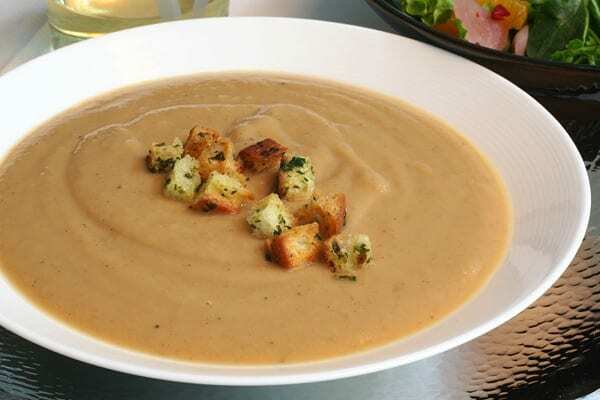 I’ve never tried chestnut soup, but now it’s a must! Such a good post!!! I love the soup. Crème de marrons is absolutely one of the highlights of Fall in France for me =) Great photos too! Oh, you’re making me so hungry! One of my favorite fall combs is pasta with pumpkin and sage. Anything with baked apples. Yummy salads with roasted root vegetables. I hate letting go of summer and sometimes the only thing that staves off the autumn blues is delicious fall dishes! @Amy, so are so right, knowing that you are going to be able to enjoy certain seasonal foods makes it so much easier to say good-byte to one season and hello to another. Cassoulet! Not so much in Paris but in Toulouse I look forward to it. I live in Seattle WA during the winter months and I never used to look forward to the rain and drizzle but as summer closes I can’t get my mind off Cassoulet. For three days my house smells wonderful and for the next two weeks the smell lingers. @Grant, I was just talking about cassoulet today and I TOTALLY agree! I too discovered chestnut soup in France. I make mine with Puy lentils! @Emiglia, I never thought of doing it with lentilles – how wonderful! There’s a lot of spaetzle in Germany, too! One of my favorite quick eats here in Berlin. I saw a special on public television about truffles – totally wild. I can’t believe how much they are and the black market for fake truffles!! @Jen, the market is insane! And in France it is hilarious to watch the “dance of the sale” in the local markets.